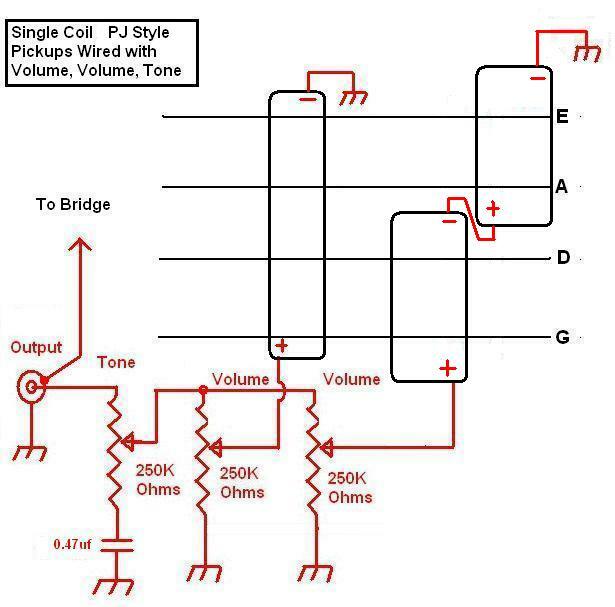 Now here is a wiring method for the Precision Bass (P-Bass) pickup and Jazz (J-Bass) pickup. This method has the sensors in parallel wiring mode. This wiring method shown is for passive sensors. NOTE: You should be able do this with active sensors, but you need to get power (9v or 18v) to the sensors. This configuration is common on many Precision copycat models, such as Ibanez, Jackson, Carvin, and many others. The beauty of this configuration is that you get the best of both worlds, a nice Precision pickup sound, and a similar Jazz bass sound, which works well for live situations, plus the single bridge jazz bass pickup sound. 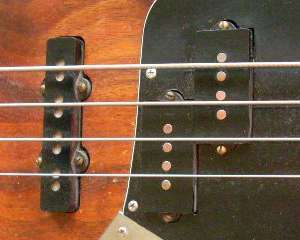 The critical thing here with this type of pickup configuration, is that when you use a single coil Jazz Bass pickup, you will need to sacrifice the hum-canceling wiring of the Precision pickup, thus you will need to wire it as a single coil pick. If you do not do this, you will find that two string are definitely out-of-phase. However, if you do not wish to have two single coil pickups, which are susceptible to hum, you should use a split coil J-Bass pickup (Dimarzio make this type) and then you can wire the P-Bass as hum-canceling and have the best of both worlds, with out the hum. Note: that the sensors are wired this time in parallel, not series. I also have two volume control knobs and one tone control. There are other options for this too. 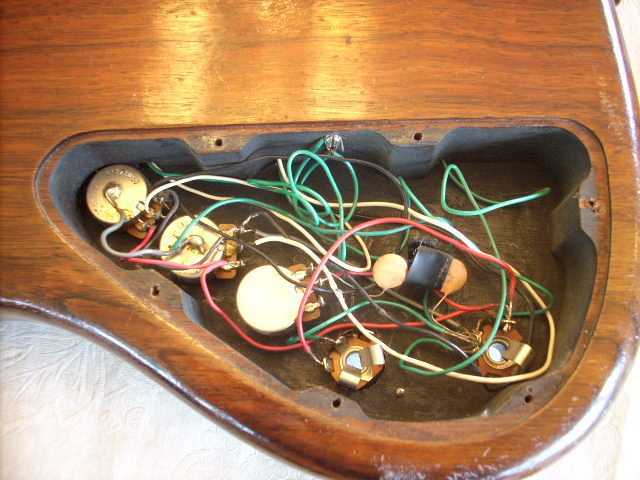 Below is the inside wiring of my P-J fretless bass. Note the back CRT paint on the walls and back. This is conductive paint for electronic shielding, and it works very well.